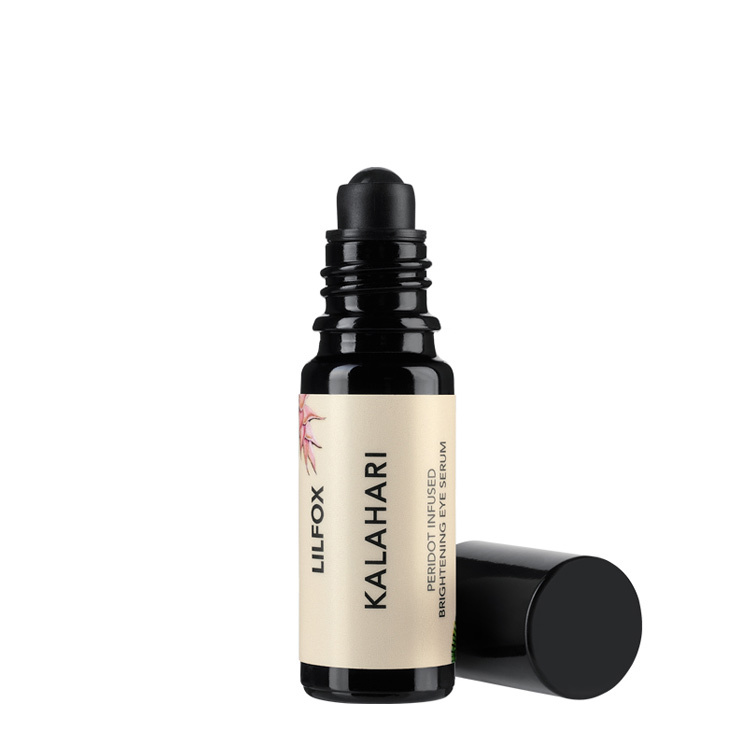 The LILFOX Kalahari Eye Serum is a nutrient rich infusion that imparts a look of bright, toned, moisturized skin. A unique formula of concentrated super fruit oils, like watermelon, pomegranate, rosehip, passion fruit and prickly pear seed, lends a revitalized appearance to the under-eye area. Ultra-rich argan and green coffee bean oils contain potent antioxidants that give a smooth, repaired, and tightened effect to the skin around the eyes. You’ll dispense the perfect amount of this brightening eye serum thanks to the convenient glass roller ball applicator, making this an easy to apply and seamless eye serum. This exquisite formula is designed to be used both in the morning and before bed, and may also be enjoyed throughout the day to give eyes an for an instantly perked up appearance. It's a fabulously non-greasy serum, which allows for makeup to be worn over. Gently roll along under eye area once back and forth after cleansing and toning face. For Daytime + Nightime use. I REALLY loved this product from the beginning and after months of use, I still love it. I am not one for very heavy eye creams/serums (maybe as a quick eye mask 1x a week during the winter). This serum is perfect for me. It's lightweight and soaks right in (so much so, I use my Fitglow Conceal+ right after it with no issues). Even though the roller ball applicator has it's own temperament, either dispensing little or too much product, I don't mind it. It's better than some that always release tons. I just take the extra and move it to the other eye or to the lips if both eyes have sufficient. If you don't love this product as an eye treatment, use it on your lips as a lip serum or just roll it on your face. This product will surely be a repurchase for me. Have been using this twice daily since it arrived and no benefits at all to my undereye area. The oil just kind of sits there and the applicator can be cumbersome. Either too little rolls off or too much. Have seen no benefits sadly. All of Lil Fox skin care are positively baskable. I feel like I'm in a saucy new dress when I'm wearing her Prickly Pear face oil. People are clocking my glow, and giving me second looks. (Or maybe it's the way I swan about, throwing my face into their line of vision, ready for their admiration). This eye roller soaks in quicker than most, so I end up using it diligently. And with great effect! Also love her honey enzyme scrub. It lasts for months, even with regular use, and smells cosmic. I have my tried and true eye products, so I wasn't expecting to be impressed, but boy. Am I. Hard to describe, really. It feels cool upon application. The oil is very light and nourishing. I have noticed a brightening effect after just a week of PM use. Typically an effect like that would take months of regular use, so I'm not sure how it's coming through so quickly, but wow. I agree with l'amour et la musique, this is the stand out product from October's box. For reference, I have been using Biossance Squalane + Peptide Eye Gel under makeup and Belif Moisturizing Eye Bomb before bed. My eye area is well hydrated, but something about this formula has next leveled everything.